Mesh leggings (also called mesh cutout leggings) are a trend nowadays. They are usually black color but these are gray with black mesh. 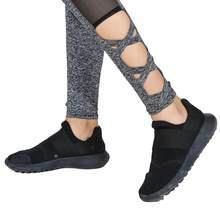 Mesh cutout leggings look great, they are high-quality, very comfortable because of the spandex and polyester blend. Great for fitness workouts, yoga classes, and any other activities as well as for simple everyday wearing. With the difference in the measurement method, please allow 1-3cm in the size deviation. Perfect fit, look great on. excellent! quality, nice design. i recommand this. the material is great quality and they fit just right! Really nice stretchy material, the elastic at the top is not the best quality, but works well. Fits as expected and worth the price. The quality is great and stretchable. Very fast shipping! Best store ever!!!! Fast shipping perfect quality whatever i bought from this seller all perfect.I m in love with this sellers products. I will order more and more.Thank you so much for fast shipping and good quality. came fast in two weeks, and quality is good, stretchable, ordered M size, I recommend. Excellent quality, fast delivery, 9 days to arrive to canada, nice gift, excellent store, I recomend it. I order size M and fit great.